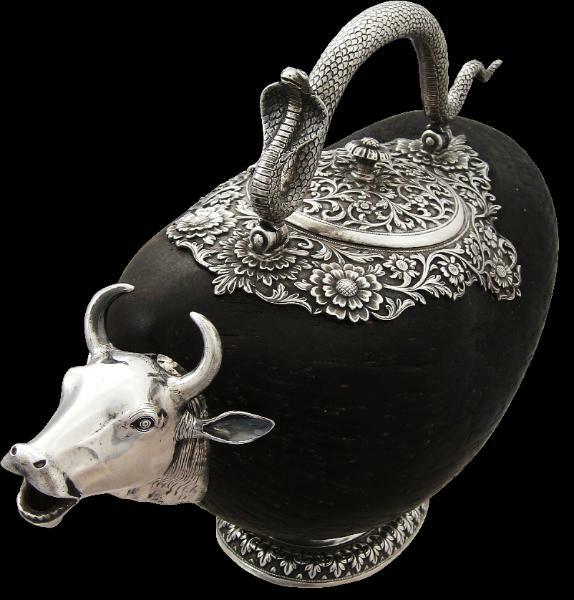 This vessel with a coco-de-mer body in the form of a cow is known as a goumukhi and is used to hold and pour holy water from the Ganges. Goumukhi vessels are rare; only a handful have been published. 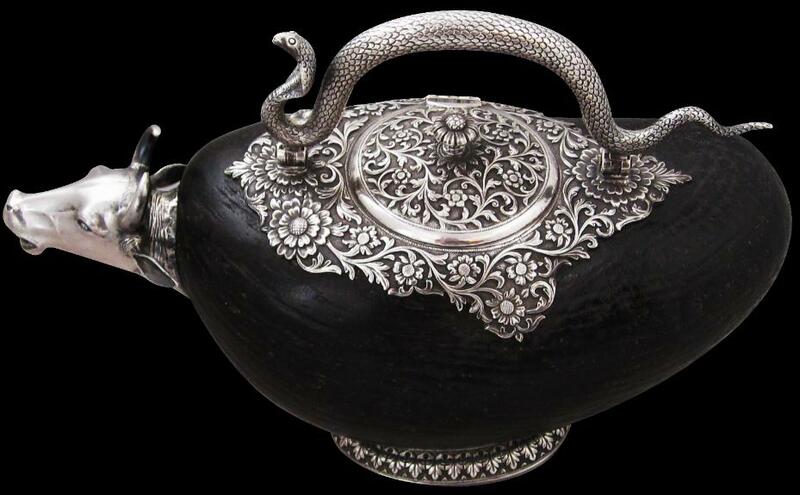 And of these, this is the only example to have come to light that is signed by Oomersi Mawji, India’s most celebrated 19th century silver-smith. Quite possibly, this is the only O.M. goumukhi. As an O.M. 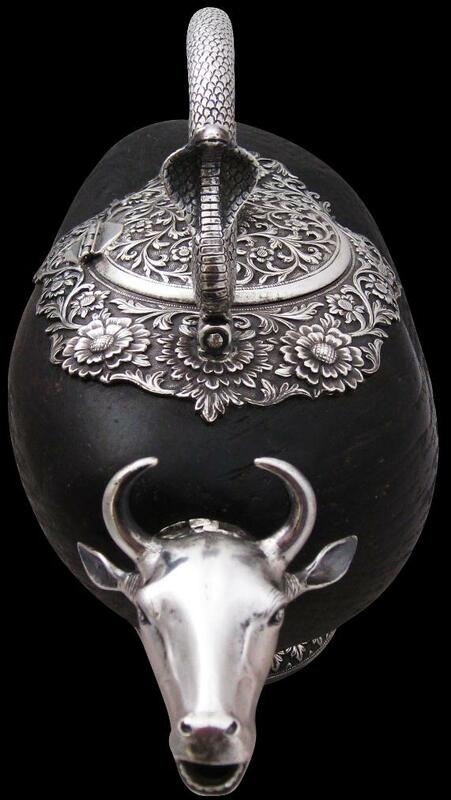 piece, the quality of the silver-smithing is superior to all the extant goumukhi water carriers. It is also rare to encounter a piece by Oomersi Mawji that is of local form and use rather than of European form and for export to Europe or for local colonial clients. Each of the mounts has been formed with exceptional attention to detail. 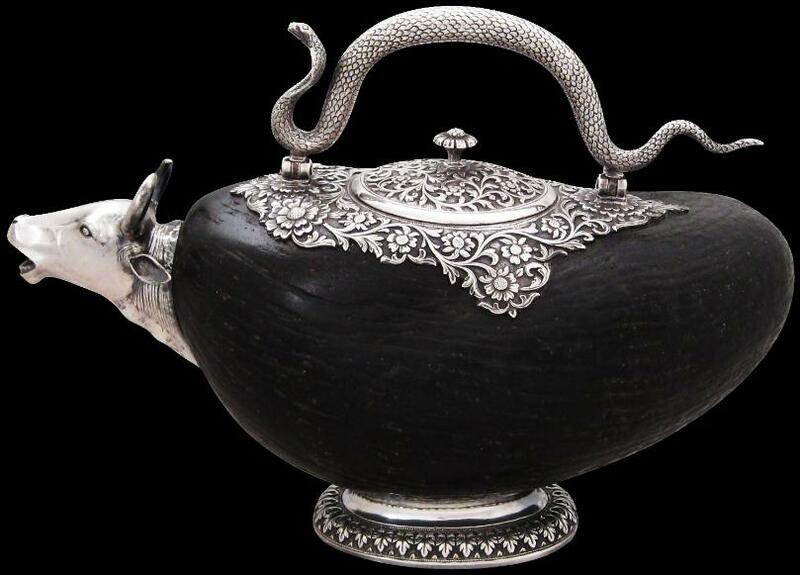 The handle is in the form of a perfectly-formed cobra; each scale has been carefully rendered. 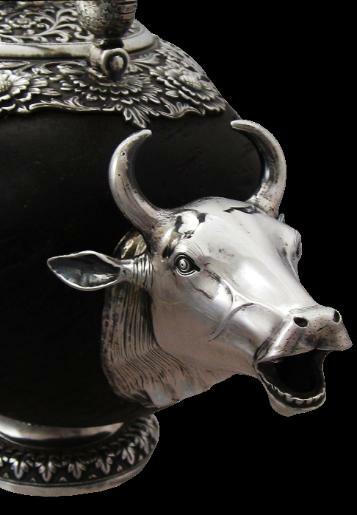 The spout is in the form of an exceptionally realistic cow’s head, with horns, prominent ears, teeth, a fringe, a neck covered in loose, wrinkled skin in the manner of Indian cows, and even pores on the snout. 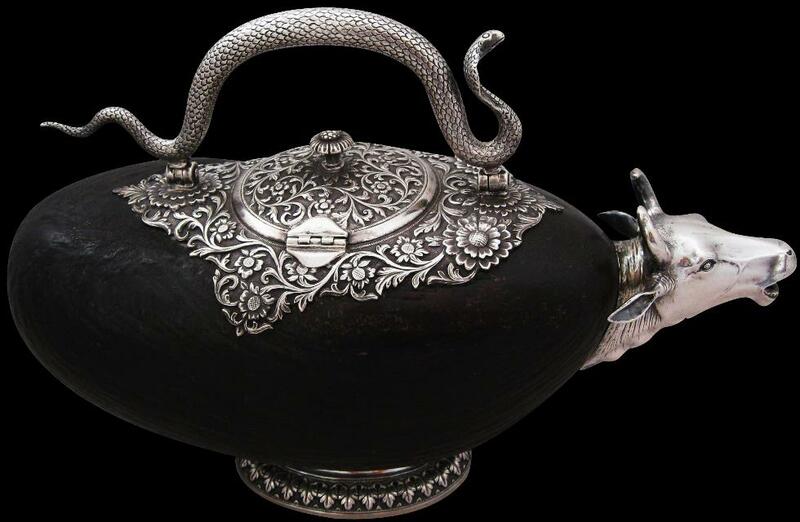 The silver covering and lidded opening on the back of the vessel follows the natural form of the coco-de-mer and is beautifully repoussed with deeply wrought flowers and scrolling foliage against a ring-mat background, as is the oval, ring-shaped foot. 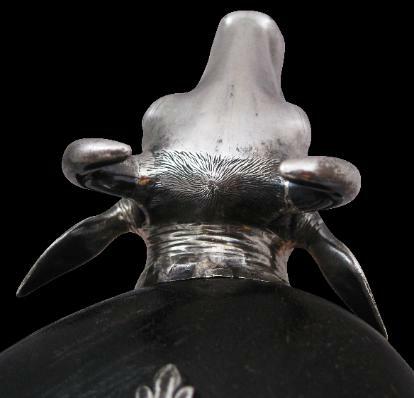 The finial for the hinged lid is has been cast in the form of a single, open flower. 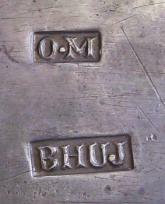 The base is stamped with a well-cut cameo punch with the initials ‘O.M.’ and the word ‘BHUJ.’ Wilkinson (1999) points out that items with this crisp punch tend to be the earlier items most likely associated with the hand of Oomersi himself, and belong to the period 1860-1890.
sadhus to carry Ganges water. 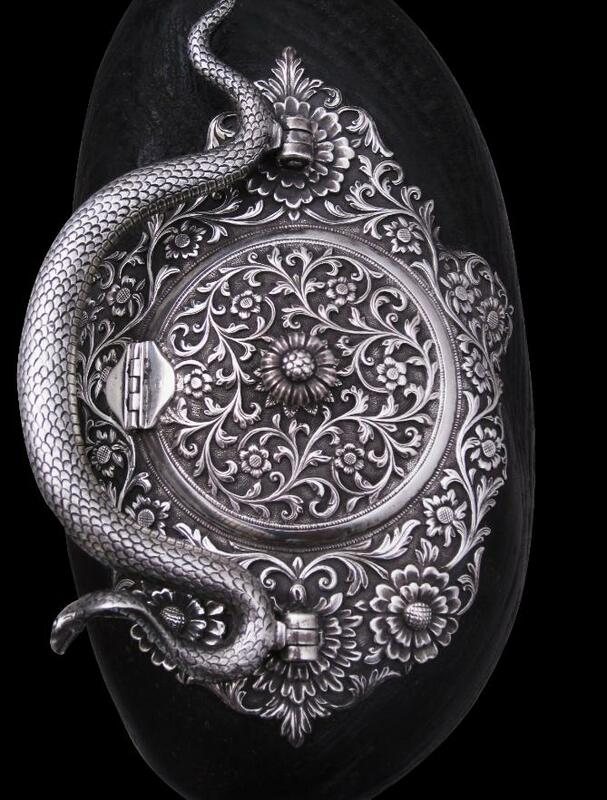 The leafy and floral fronds that decorate the silver work suggest the new life that springs from the waters. The coconut, being a source of milk, oil and food, was regarded as auspicious. Also, there are parallels in that coconuts are a source of coconut milk, making the use of a coco-de-mer in this way appropriate for use as the body of the cow. The use of coco-de-mer shells for vessels of this nature has parallels with European sixteenth century usage. A handful of coco-de-mer nuts with silver-gilt mounts are known in several European museum collections. The nuts are of Seychelles or Maldives origin and the mounts are either Portuguese or German. The belief in Europe at the time was that such nuts originated from the sea, hence their name – literally, ‘coconut-of-the-sea’. The nuts were thought to have curative properties for illnesses such as colic, paralysis and gout and to counteract the effects of poison, with these benefits being passed to water stored in vessels made from the nuts. A Portuguese doctor based in Goa published an account in 1563 in which he commented that the nuts come in pairs and that no-one had ever seen a nut growing on a tree but that their source was the ocean. The nuts were comparatively scarce and were highly prized. 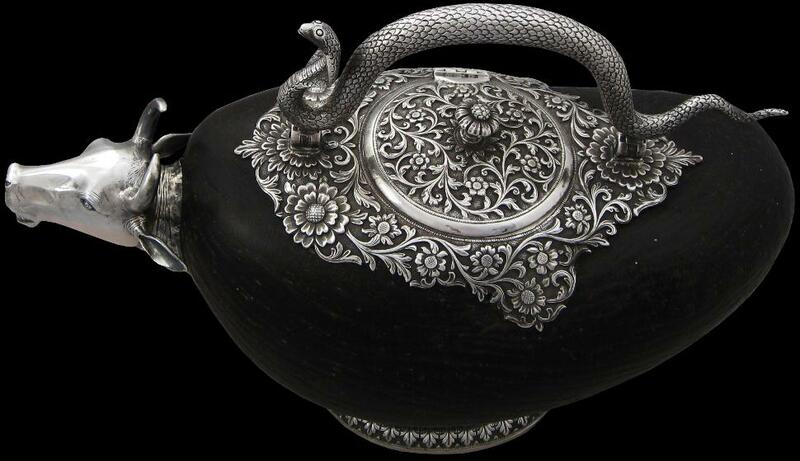 Oomersi Mawji was the pre-eminent Indian silversmith of his time. Together with his sons, he established a workshop in Cutch around 1860, where the local Muslim rulers who had the title ‘Maharao’ were an important source of patronage. Today, pieces by OM are keenly sought by collectors and museums worldwide. This item is in superb, faultless condition. 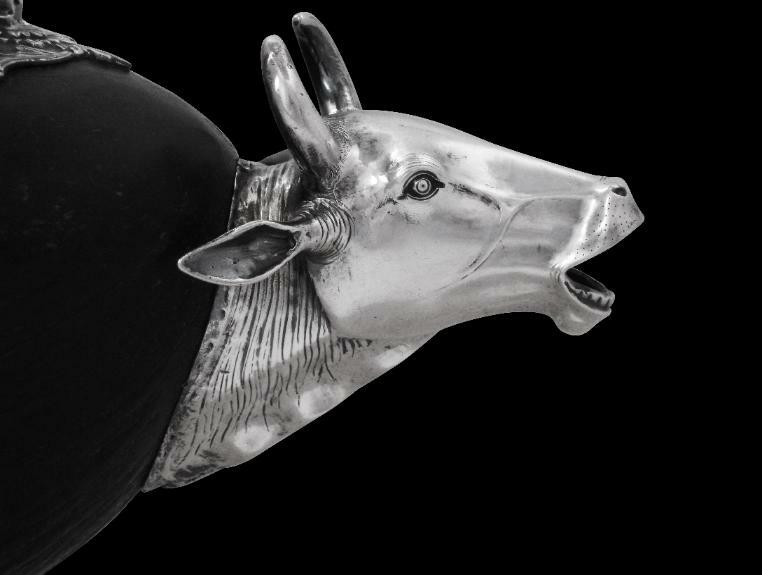 A goumukhi of similar form, entirely of silver but not by Oomersi Mawji but by an unknown silversmith was included in the ‘Reflecting Power: Three Schools of Indian Silver’ exhibition, London, 2008, curated by Wynyard Wilkinson, and illustrated in an accompanying catalogue of the same name.